An Investment Proposal. FOREIGNERS CAN BUY! 100% FOREIGN OWNERSHIP ALLOWED! Welcome to your private piece of heaven on the world's premiere island paradise! On the world-famous tropical island paradise of Boracay will rise a luxury hotel that provides elegant accommodations, exceptional facilities, and unforgettable Filipino hospitality: the Crown Regency Boracay. In continuing the fine tradition of the Crown Regency group of luxury hotels, the Crown Regency Resort-Hotel in Boracay will exceed the expectations of island vacationers looking to enjoy this Philippine island's powder-fine white sand, crystal-clear turquoise waters, and incomparable sunset. Impeccably designed for the traveler of distinction, elegantly furnished for the tourist seeking the finest accommodations, and perfectly situated for the vacationer desiring the best location on the island, this Boracay resort and hotel upholds the tradition of excellence ingrained in all Crown Regency hotels. Mix business and pleasure in one fabulous location! On the Philippine island paradise of Boracay will rise the Crown Regency Convention Center, a first-class property that combines the best of both worlds for the discriminating traveler: finely appointed Boracay accommodations and world-class business and conference facilities. This Boracay hotel will be the first world-class conference center on the island, and with its twin benefits of value for money and impeccable service, is soon to become a legendary property on this tourists' dream island. Each guest room at the Crown Regency Convention Center in Boracay is comfortably decorated with top-quality furnishings and all the amenities needed to make for an unforgettably relaxing Boracay stay. Designed to meet the needs and expectations of well-traveled citizens of the world, this Boracay hotel seamlessly and effortlessly combines business and pleasure, thanks to the efficient hospitality afforded by the staff of this Boracay hotel. As a member of the Crown Regency group of luxury hotels, the The Crown Regency Convention Center and Prince Hotel in Boracay is the ideal hotel in Boracay from which to do business or leave it all behind! Experience Boracay the way it was meant to be experienced at the Crown Regency Convention Center. A PERFECT GETAWAY FOR THE PERFECT INVESTMENT! ONE OF THE MOST BEAUTIFUL ISLAND AND THE COUNTRY'S BEST JEWEL KNOWN WORLDWIDE. Only 35-min. flight from Metro Manila and 50-min. flight from Cebu City. Easily accessible by land, air & sea According to 2007 latest report, (script from ABS-CBN Sports Unlimited Presented last 10om of May 26, 2007 Hosted by Marc) Boracay won the title as the BEST TROPICAL RESORT in the WORLD. According to the Department of Tourism, the island needs about 10,000 rooms but currently there are only 5,000 available. THE ISLAND WELCOMES 400,000 VISITORS EACH YEAR FROM ALL OVER THE WORLD. 2nd Quarter of 2004, the Kalibo airport started accepting international chartered flights from Korea and Taiwan. Majority of Boracay foreign tourists come from Korea, USA, Germany, UK, China and Japan. Opportunity to own a piece of tropical paradise in premier vacation capital of the Philippines through acquisition of a preferred stock share ownership representing a specific condotel unit. Condotel Unit ownership with Club Ultima membership Hotel room nights privileges in any Crown Regency chain of hotels nationwide: Cebu, Davao, Makati, Mactan, Boracay. Access to world class facilities through Interval International hotel exchange of more than 2,000 hotels and resorts, worldwide. Guaranteed 45 days free nights per year accommodation even during peak season (with priority booking as unit owner). Projected substantial returns on investment through condotel operation. Boracay is a tropical island conveniently located at the northwestern tip of the province of Aklan. It is a coral island with a total land area of 1,083 hectares. It is 7 kilometers long, 0.5 km. at its narrowest and 2.0 km. at its widest. Laced with a beautiful stretch of beach 4 km long that is known for its powdery white sand unequalled not only in the Philippines but anywhere else in the world. Boracay is composed of 3 barangays of the Municipality of Malay. With a local population of about 13,000 whose main source of livelihood is tourism. The island was declared a tourist zone in 1978 and tourism development has expanded rapidly since then. Boracay is the Philippine's major tourist destination. Tourist arrivals in 2005 was 499,457. The average yearly increase from 1998 to 2005 was about 20%. Local tourists accounted for 69% of arrivals in 2005 while foreign tourists consisted of 31% of arrivals. The influx of foreign tourist manifests an increasing trend since 2003, with Koreans registering the single largest nationality that visited the island, accounting for 65% of foreign tourists. Travel by air via Kalibo/Caticlan is the fastest way to go Boracay from Manila or Cebu. Asian Spirit & SEAIR has more than 45x flights daily from Manila to Caticlan and other routes. PAL & Cebu Pacific Air each has 3x flights daily via Kalibo. Soon Air Phil and Cebu Pacific will fly the Manila to Caticlan air route. Via Dumaguite on Negros Navigation or WGA Superferry. Travel time is about 12 hours, however, upon reaching Dumaguit, you still have to travel about 1 ½ to 2 hours by land before reaching Caticlan jetty port. The cheapest way to Boracay is via roll on roll off (RORO) trips to Panay Island. Daily Philtranco airconditioned or non-airconditioned buses leave for Panay via Caticlan. From Manila via bus to Batangas pier, travel time is about 2hrs to 3hrs depending on the traffic. Batangas to Calapan by boat takes 2 hours, another 2 hours by bus from Calapan to Roxas pier, then 4 hours by boat from Roxas pier to the Caticlan jetty port. Area: 382-room resort condotel with an approximate area of 12,000 sq.m. Location: Located in Barangay Balabag along the main road of Central Boracay. Only a 3-minute leisure walk (5-meter wide brick flooring) to the Station 2 Beach. Only 5-minute walk to Bolabog Beach Safe, located near Boracay Police & Coast Guard station. Only 5-minute away from Caticlan Airport is the Crown Regency Welcome Center with the staff to welcome & assist you. Parking facilities for privately owned vehicles are available. Crown Regency with its own private boat will take you to Boracay Island. When you reach the island, private shuttle van of Crown Regency will transport unit owners & guests within the island. Boracay Multiple Properties Developers, Inc. a 100% subsidiary of J. King & Sons Co., Inc.
Fuente Triangle Realty Developement, Corp., another subsidiary of J. King & Sons Co.,Inc. The sales and marketing team behind the rising Ultima Residences Towers in Metro Cebu. Crown Regency Hotel Group, an experienced and established hotel chain owned by J. King & Sons Co., Inc. Resort has six (6) glass elevators to cover all floors. Philippine and Foreign Nationals are eligible (Residents or non-residents). Investors will purchase company stock share in Boracay Multiple Properties Developers, Inc.
one(1) stock share is equivalent to one(1) condotel unit. Unit are designed on a thirty (30) sq.m. (standard) or forty-five (45) sq.m. (with loft) equivalent to one (1) stock share.] Units are all fully furnished with kitchen, TV and standard hotel amenities. Investors will have the option to reside in their units or enroll in the condotel operations. For residing investors, they will have to pay administrative maintenance fees as in standard condotel operation. For condotel enrollees, the administrative and maintenance fees will be deducted from gross income from Condotel Operations. Plus 7-day free stay at Club Ultima or any Crown Regency operated hotels nationwide annually. Subject to 3 months prior notice before expiry, the unused 45-day free stay is convertible to same room night equivalent at any Crown Regency hotel with no expiry period. The 45-day free stay could also be exchanged with 2,000 Interval International affiliated hotels & resorts worldwide. This unique condotel investment opportunity entitles the unit owner the added advantage of using multiple properties in any Crown Regency Hotel & 2,000 resorts worldwide - An unmatched privilege never offered by any other company in the Philippines today. * Income from a 320-Day enrolment in Condotel operations. A very conservative assumption of 60% occupancy/year and US$ 100/day still gives you a projected income of US$ 9,600 (PHP 441,600) per year. Condotel Enrollees earn US$ 5,250 (PHP 241,500) MORE than the standard bank deposit. In addition to the projected net income, investors have their 45-day Free Stay guaranteed benefit which they have the option to sell. * Investors could look forward to an estimated 5year full return of their investment while enjoying the good life in Boracay or the privileges & benefits of being a member of CLub Ultima and in all of its off-site facilities through the Crown Regency Hotel chain. The bigger the investment the higher the returns. Investors could look forward to an estimated 5-year full return of their investment once the condotel is operational and unit is fully paid for. In the meantime, he can enjoy the good life in Boracay or the privileges & benefits of being a member of Club Ultima and in all of its off-site facilities through the Crown Regency Hotel chain. Upon operation of the condotel, investors will receive percentage of income based on the payments made to the total contract value. If investor has paid less than 50% of the total contract value, investor receives 25% of the income due. If investor has paid 50% to 70% of the total contract value, investor receives 50% of the income due. If investor has paid 70% to 90% of the total contract value, investor receives 75% of the income due. If investor has fully paid the total contract value, investor receives the full income due him. 1 Resell the unit at the open market. 2 Resell the unit to Fuente Traingle Realty Development Corp. at acquisition price. 3 Resell the unit to the open market through Fuente Traingle Realty Development Corp. for a minimal fee. Boracay is a haven of natural beauty and splendor uniquely on its own- And Crown regency Group of Hotels has captured this ambience in the island by integrating the elements of Earth, Fire, Water, and Wind in the master planning of the four (4) resorts. Well-planned promotions and expertise of the hotel operator and their marketing channels will ensure a high occupancy and ultimately high investor returns. The Calmness of Water Crown Regency Resort & Convention Center. A resort experience at your doorstep, lavishing the luxury of peace and stillness of the waters. Centrally located in Station 2 with 3 minutes walk to the long beach and 5 minutes walk to Bolabog beach, the resort's biggest swimming pool in the Island, its lush landscaped garden, fascinating & innovative facilities and amenities, is singularly unique,exciting and a fullfilling Boracay experience. Crown Regency Resort. At the station 3 beachfront. The 40-unit resort owes its design inspired by a sun drenched island, a beautiful view of the sunset, creating an amazing display of amber hues exemplifying the passion of fire. It has an infinity pool at the deck and a conference room with capacity for 80 people. Essences of the fire element are shown in patterns of sunshine as streaks of sunlight penetrate the warm and vibrant interiors of the resort. Crown Regency Prince Resort. Strategically located at station 1 at the crossings of the main road & the road leading to Bolabog beach. This 19th-century inspired resort is a structure of stone and hardwood highlighting the stability and solidity of the Mother Earth. This boutique hotel is a good medium of gracious hospitality, warm service and the pleasure of a carefree vacation. It has 24 earth inspired rooms, coffee shop, convenience stores and other specialty shops. Crown Regency Bayview Resort. Located at one end of the Bolabog beach cove. This resort brings the element of Wind on its modern design of glass walls and chrome interiors. Associated to a new day and a freedom for new experiences, the element of Wind is felt from the generous amount of light and view from your doorstep as you feel the peaceful trade winds blow offshore and the topaz blue waters of Boracay beaches dancing from your bedroom window. A sense of freedom awaits you here, to touch to inhale and to experience freedom where the wind blows. The condotel unit Purchase Agreement for Crown Regency Resort & Convention Center is irrevocable upon signing. A reservation deposit of One Hundred Thousand Pesos (P100K) payable to Fuente Triangle Realty Development Corporation is required upon signing. The balance is subject to the agreed terms of payment to be completed within thirty (30) days. Cash Payments are also given thirty (30) days to complete. Q1.How does the Condotel operation differ from Timeshares? period of time. When you own a unit in Crown Regency Resort & Convention Center, you own a preferred stock share in the company wherein your share/s is represented by a specific condotel unit. At the same, since you own a club ultima membership you have a vacation exchange privilege with Interval International. replaced by a title to the unit? If so, when? is indicated in the Articles of Incorporation of the company. Q3. How does the condotel operate? Management Services, Inc. as a resort hotel. Subject to advance booking, unit owners have priority use of their condotel units or an equivalent type for 45 days every year for free . If the usage will exceed 45 days, they will have to pay the member's rate (30% discount from regular rate). Q4. Are there additional cost incurrences to be shouldered by the unit owner upon enrollment in the condotel operations? A4. Yes, an initial one time joining fee of Php 30,000 / unit will be required to cover initial operating expenses. Q5. What fees do we pay Crown Regency Resort & Leisure Park Management Services, Inc. as hotel operator? All salaries of sales & marketing and reservation staff except for promotional and advertising collaterals All expenses related in maintaining a sales & marketing office. All salaries of general managers & resident managers. The hotel operator also guarantees to exchange the unit owner's unused 45-day free stay in his condotel with Crown Regency Hotels room nights nationwide with no expiry period. As a premium responsibility to the hotel operator, if total expenses do not exceed 30% of net sales which shall result in a 50% gross operating profit before income tax, an additional 3% of net income will be given as a bonus to the hotel operator. A6.No, insurances are sourced by the hotel operator and are shouldered under operating costs covered in the estimated 50% hotel operators share. Q7. Can a unit owner live in their property full time? A7. No, this project is for investors only. You are required to enroll in the condotel operations for a minimum of ten (10) years with further option available to the operator which he is likely to invoke to extend the term on expiry subject to mutual agreement as per majority vote of the unit owners’ association. Q8. When is the declaration of dividends? A8. Quarterly or semi-annualy, as may be mutually agreed upon with the unit owners. Q9. What are the considerations in determining revenues & dividends for unit owners? A9. In order to maximize returns and ensure cost efficiency for unit owners, only room revenues and room divisions related expenses are considered in the determination of income such as housekeeping, laundry, front office, security, repairs and maintenance, utility, taxes, and insurance attributable only to the units. F & B income and its related expenses such as F & B personnel, kitchen equipment, supplies, utilities, taxes, and insurance are treated separately from and independent of the room division expenses of each condotel units. This set-up assures the unit owners a cost efficient operation as room related expenses are easily controlled and managed. Q10. How will dividends be paid to the unit owner? A10. Dividends are payable in checks to be mailed to unit owners or paid directly to the bank accounts of unit owners. Dividends will be in peso currency. For foreign currencies, prior arrangement can be made with the hotel operator on a case to case basis. Q11. Are there any other condominium association dues? covered in the estimated 50% hotel operation income. Q12. What is Unit Owners' Association? management of the condotel units. The association needs to elect board officers to make sure that the unit owner's interests are protectedand their units well managed. Q13. Will there be a unit owners' association? A13.Yes. All unit owners are automatically members of the unit owners' association and shall elect among themselves a board of trustees to formulate policies and implement the rules and regulations of the association. The board will be composed of nine (9) members to be elected from among the shareholders whose qualifications and voting rights are defined in the by laws of the association to be adapted by the members. Q14. Will the unit owner still earn if his unit was not rented? A14. Yes. Unit owners will still receive quarterly income based on the type of unit regardless of whether the unit was rented or not. This is because condotel operator will pool together its entire total income from rental operations and distribute this to unit owners as dividends according to the pro-rata percentage sharing on unit types. Income will come from room revenue less room division expenses. Q15. Who will shoulder the repairs and maintenance of unit? A15. Minor and Major repairs are shouldered by the hotel operator and chargeable to and part of operating cost covered in the estimated 50% hotel operator’s share. Q16. 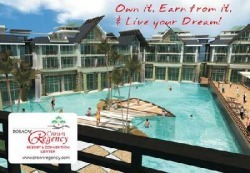 Can a unit owner use his 45-free stay in another Crown Regency Resort in Boracay? A16. Yes, he can. Only on a one to one room night basis. Q17. Is there any benefit if the unit owner does not use his free stays on peak season? A17. Yes, he individually not pooled, receives bonus on those days equivalent to room rate difference on regular days. Q18. Can a unit owner upgrade his free stay to a different unit category? A18. Yes, unit owner's free stay is upgradeable but has to pay the price difference in room rates. Q19. When do the unit owner gets his 45-day free stay benefit? A19. The 45-day free stay commences at the start of every fiscal year. This will be distributed to the unit owner in terms of certificates where they are entitled to priority in booking even on peak seasons provided availment of the 45-day free stay is exercised and availed of by negotiating in advance in the use of the unit. Q20. Can a unit owner use his 45-free stay for more than one unit at the same duration? will stay in the resort for a week and he’ll rent another unit for his friend. He will consume a total of 14 days for that week, chargeable to his 45-day free stay. Q21. What if the Unit Owner was not able to use the 45-day benefit? Q22. Can a unit owner who has made an initial booking to use its 45-day free night stay but who eventually cancels it and make a new booking dates to use his room unit be allowed? A22. Yes, provided the notice of cancellation is made two (2) weeks in advance but the new booking dates subject to availability of room units. This is because all the pooled room units are blocked and rented on a day to day basis by guests of the hotel condominium facility, hence, advance booking is necessary. Payment Terms : NOTE : ADVISING EVERYBODY TO TREAT THE PRICES BELOW AS TEMPORARY. PLS COORDINATE WITH US FOR PROPER PRESENTATION. NEW PRICES (IF THERE'S ANY) SHALL BE UPLOADED A.S.A.P. Note : Pricing are inclusive of Club Ultima Membership with 7 FREE room nights with option with Interval International, subject to payment of regular charges imposes by Interval International. - All checks should be made payable to Fuente Triangle Development Corp.
- Full profit of investors starts when investment is fully paid. price. Discount applies only to one (1) Unit. Members with one(1) room night privilege must upgrade to seven (7) room night privileges to avail of the member's price. For non-members, price includes CLub Ultima membership with 7 FREE room nights with option to enroll with Interval International, subject to payment of regular charges imposed by Interval International. All retention payables should be covered by blank dated checks. Six(6) months prior to the start of the condotel operation, buyers will be informed that the blank dated checks will be deposited. For buyers with unpaid balances at the start of condotel operations will only receive 70% dividends due until purchase amount of unit is fully paid. All checks should be made payable to Fuente Triangle Realty Development Corporation Full profit of Investors starts when investment is fully paid Reservation deposit of ONE HUNDRED THOUSAND PESOS (Php 100,000.00) is non-refundable. Cash paying Investors will be given first priority in choosing Units and a 45-day FREE stay at any Crown Regency Hotel as signing bonus. Hold on, as previously stated above : There will be a SIGNING BONUS of an additional 45 days FREE stay (first year only) if you will pay CASH - AN OUTRIGHT PAYMENT. 45 days shall only apply to areas where Club Ultima or Crown Regency hotel are located and Boracay is not included. Construction schedule commence hopefully, if their is no changes on June 2007 and the target approximate completion date will be on June or July 2008. Launching on first week of July 2007. Construction commence hopefully on Sept 2007 and not June 2007 because of government regulatory requirements which needs to be processed. Construction is 1 year).